as one of the artsy ants is currently getting to know her baby girl and adjusting to life as a mother of two, we've invited some fellow bloggers and crafty friends to share guest posts with us all. today, please welcome kat ezat of life's jewels on string. Sometimes it's necessary for my hubby to travel for work. Last time he needed to carry his laptop in a smart messenger bag, but was reticent to shove his nice computer in there for fear of scratches. I had an idea: why not fashion a thin light cover that will protect the surface but not add weight or bulk? This is probably a common problem, so I would like to share my solution. I dived into my bag of old clothes/sewing scraps (yes I have one, probably more like three - maybe I have a problem...) and pulled out an old H&M wool vest. Amazingly it was more or less exactly the size of the laptop, great! -First I placed the computer on the inside-out vest and tried to decide a sensible way of fitting the laptop 'into' it. I saw that the bottom edge of the vest was nicely finished and thought I could retain that as the open side of the cover. 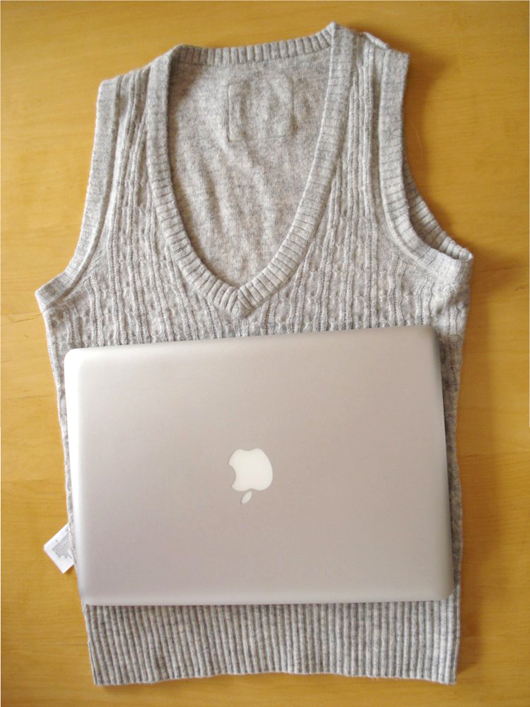 The width of the vest matched the width of the computer almost perfectly, except where it increased for the bust allowance. So I could use the existing side seams, just evening them up a bit. I would need to close off the back to form a case that is closed on 3 sides. 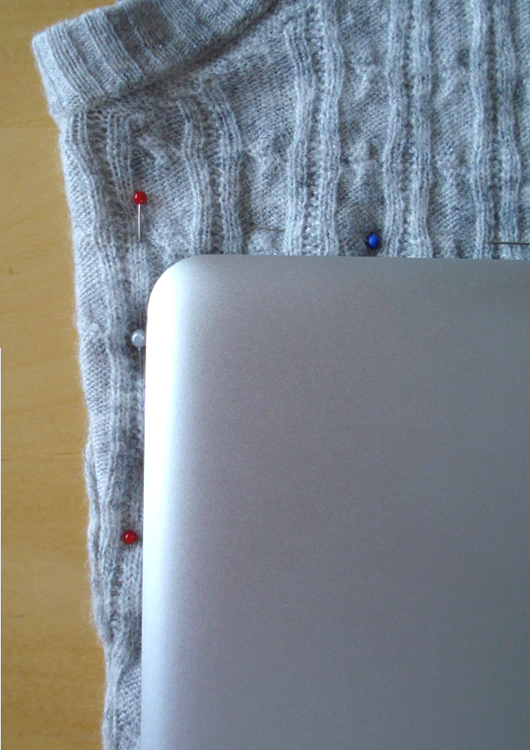 - Once I had positioned the laptop in the desired spot on the vest I pinned around it to mark where I needed to sew, taking into account the straightening up on the sides. 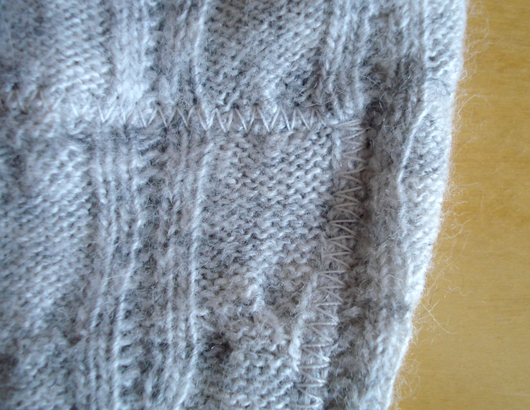 - Then I sewed along the marked lines, removing the pins as I went. I used a zigzag stitch on my good old vintage Bernina. -To finish off, I just cut off the unnecessary bits of the vest and turned the finished cover the right side out. This project is very easy and suitable for sewing beginners. It's also super quick, I think I was done in about 20 minutes! It's also extremely practical, we have both used this item several times now when taking our computers out and about. 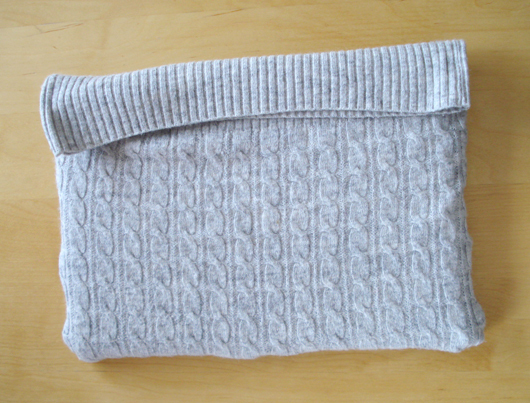 -Cut off the excess fabric after sewing the new seams, especially when using a knit fabric. This avoids everything unravelling! 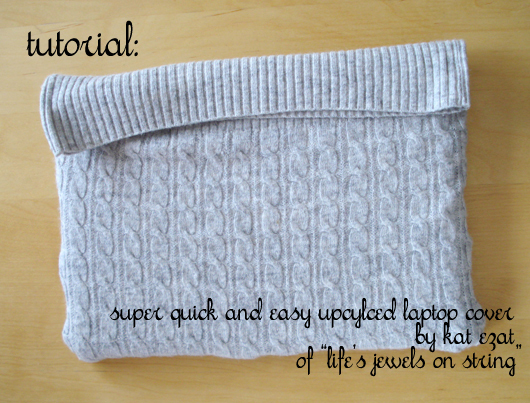 -You could fasten the laptop cover with a button, velcro or if you are a sewing pro you could put in a zip. I chose to leave enough fabric to simply fold the cover closed as I was trying to keep this simple, light and fairly unisex (it was for my hubby after all!). Many thanks to the Artsy Ants for inviting me to guest post, it's a great place to be! If you want to see more projects like this, please come and visit me at Life's Jewels on String! Kat Ezat's blog is like an online jewelry box where she keep her creative thoughts, ideas and experiences safe. “Not on one strand are all life’s jewels strung” is a William Morris quote. He was an amazing artist, craftsman and champion for the working class. On her blog she records what she makes and how she makes it for future reference, whether knitting, sewing or creating cosmetics. Kat shares what she learns from the very generous online crafting community and she hopes to give something back by providing a channel for crafters to get more exposure when selling their work. Make sure to check out her tutorial page! That's really cool, and I smiled when I saw what the cover was made of! Really genius! This is so clever and I love the way it came out! Thanks for sharing and I am a new follower! Love simple up-cycle projects like this, I shared it on my blogs facebook page Life, Love, Green! LOVE this!!!! I seriously need to make one...my computer gets tossed in my basket every night...it would like a nice, warm, cozy to hold it together! Thanks so much for linking up! Thanks for sharing this upcycling idea. And it's so simple. Your husband must have been very proud, carrying that cover half way round the globe! I'll try to copy that idea and use it as a present for my friend's husband. Simply a great idea! I would love to feature this on Reduce, Reuse, UPcycle. Feel free to stop by and grab a featured button. Thanks!